Diane teaching Karen how to knit with 4 double-pointed knitting needles. 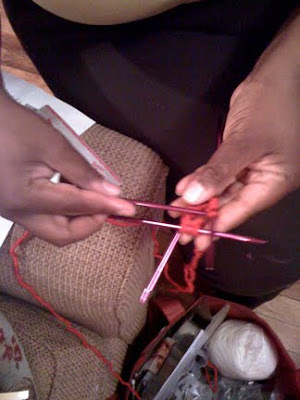 Last week Diane of Lady Dye Fiber Arts and Designs invited Boston Handmade to her home for a night of knitting. The beauty of a knitting night with an expert like Diane is we can have all our questions answered, get help on current projects, learn new techniques, and check out all the cool knitting "tools" and yarns that someone of Diane's caliber has in her stock pile. 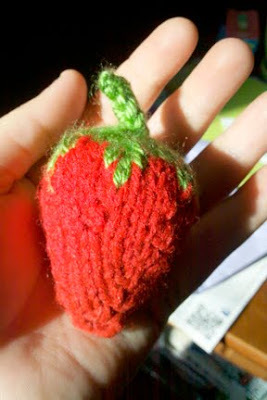 Diane taught Karen of City By The Sea Ceramics how to knit with DPNs (double-pointed needles) so she could make strawberries to use in her ceramics displays at upcoming shows. Check out Karen's finished product above! So amazing - and she is a brand new knitter too! What talent. 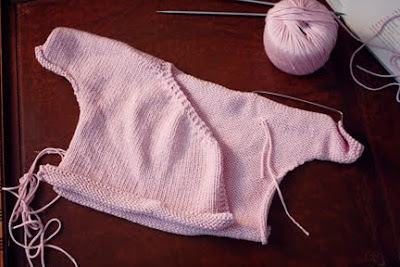 I spent the night working on a baby wrap-around jacket for our daughter who is due in November, and I was tragically stuck on one part of the pattern. Diane guided me through it and now all I have to do is sew up the seams, add a ribbon tie, and it will be finished! I'll post pix of this finished product and other tiny items I'm making for our daughter-to-be when they are all camera ready. In addition to being an expert knitter and a knitting teacher, Diane dyes yarn with natural dyes, and spins her own yarn too. 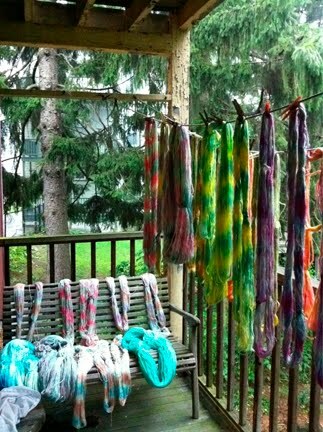 I love this photo of Diane's latest batch of natural dyed yarns and can't wait to see them in person at upcoming shows. Thanks for a great knitting night everyone!